Source: Fördertechnik 7-8/2003, mr. Otmar Feurstein, chef editor. Who does not want to lift 2 pallets at the same time in order to double loading and unloading capacity? By using telescopic lift truck forks, KOOI-REACHFORKS®, COOP improves the internal logistics considerably. KOOI-REACHFORKS® is a quality product that is produced in The Netherlands. Thousands are being used worldwide. Users of KOOI-REACHFORKS® cannot afford to work without these telescopic forks. Also in Switzerland these telescopic forks have proven to be of great value. People responsible for logistics are very content with the concept. Nevertheless it might be possible that some companies do not know that these telescopic forks exist. Therefore we have visited the distribution centre of COOP. They have got years of experience in working with KOOI-REACHFORKS®. Fördertechnik: Mr. Zimmermann, could you tell us what the advantages are of using telescopic forks? Alois Zimmermann: Head Technical service at COOP, distribution centre Wangen. Telescopic forks are mounted on our lift trucks, this is because more actions can be done and will have to be done. Our lift trucks are able to load and unload pallets and roll cages from one side. With telescopic forks pallets are always supported sufficiently and the forks do not stick out at the back of the pallets. This prevents damage to other products and we have the certainly of working with pallets or roll cages that are damage-free! By extending telescopic forks we are able to lift 2 pallets per lift truck in trains. Lorries are loaded from one side only. Telescopic forks with a total length of 2350 mm are able to load 2 pallets from the longitudinal side or even 3 pallets from the cross side. Working without telescopic forks is unthinkable. Hilbrand Brandsma, Hill Logistik GmbH, Aarau: We supply COOP with 3 types of telescopic forks. The 3 types have got a total length of 800 mm, 1200 mm and 2350 mm. With these specifications we can guarantee COOP that pallets and goods are transported and loaded without any damage. This is also one of the main requirements of COOP. Zimmermann: Another advantage is that the lift truck driver is able to retract the telescopic forks when there is nothing to transport. 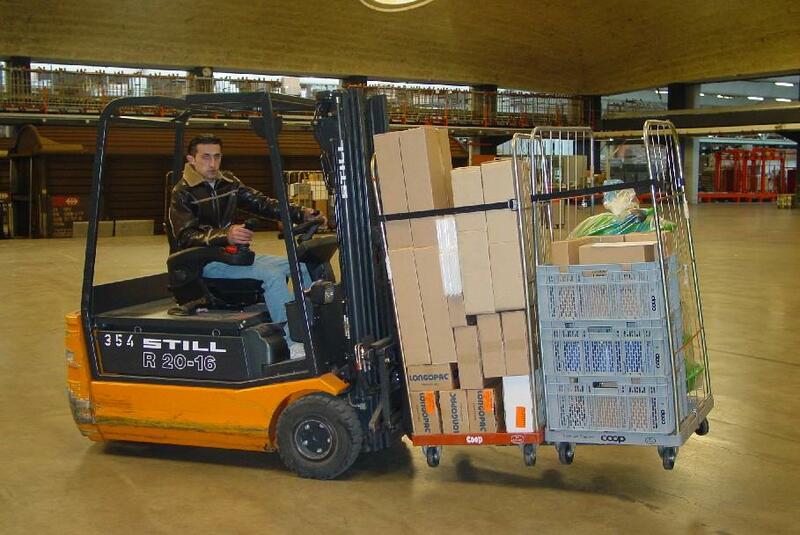 By doing that the lift truck driver is able to manoeuvre easier and faster inside the distribution centre. Of course it is also possible to use manual extension pieces which can be shoved over the standard forks. Unfortunately these preparations take too much time, the extensions are always at the wrong place in the distribution centre. Working with telescopic forks saves us about 15% in time. Brandsma: The time needed for loading and unloading of trucks and or trains is dramatically reduced. Having worked with telescopic forks makes you never want to work without these forks again. Fördertechnik: Is it difficult to mount telescopic forks on lift trucks? Zimmermann: KOOI-REACHFORKS® are ordered in combination with a lift truck because nowadays there is always an extra hydraulic function for attachments supplied on lift trucks. Brandsma: What we normally do is that we consult the lift truck dealer about the application. When using telescopic forks the load centre of the lift truck will change. The dealer will have to take along that information. Zimmermann: Our pallets weigh 1200 kg at most. In most cases we handle lighter pallets. Fördertechnik: What can you tell us about the wear of the outer forks and also how certain is the hydraulic system? Zimmermann: Just like standard lift truck forks, the outer forks will also wear out after some time. This depends on the load, but is also depends on the way a truck is handled. As a precaution an extra wear strip is put on under the outer forks of the telescopic forks. Simply by disassembling the clamping pins, it is possible to mount the outer forks. If necessary the outer forks can be replaced. The closed internal hydraulic system of KOOI-REACHFORKS® has never caused any problems. Brandsma: The bottom of the outer forks can be supplied with a wear-resistant plate. This option increases the life span of the outer forks. The internal integrated synchronisation system does not wear and improves visibility. The wear pattern of standard lift truck forks does not apply to KOOI-REACHFORKS®. Fördertechnik: How reliable are KOOI-REACHFORKS®? Brandsma: Some people have got objections, but there is no reason to. Our telescopic forks are tested with a safety factor of 3. KOOI-REACHFORKS® meet the specific ISO 13284 standard. Fördertechnik: How many telescopic forks are being used here? Zimmermann: Throughout the years we have put 45 pairs of KOOI-REACHFORKS® into use. Fördertechnik: Mr. Brandsma, what will the future bring for KOOI-REACHFORKS®? Brandsma: End users should be given more information about attachments like this. Lift truck dealers will have to point out this possibility to the customer beforehand. It is a shame that end users do not have the opportunity to double capacity with a relative low investment. One-sided loading and unloading of lorries and freight cars. Increase of volume of 40% by stacking pallets double deep. Extending forks hydraulically from driver’s seat. No loss of load thickness. “Standard” extension lengths of 800 mm and 1000 mm. Capacity from 2000 kg up to 26000 kg. 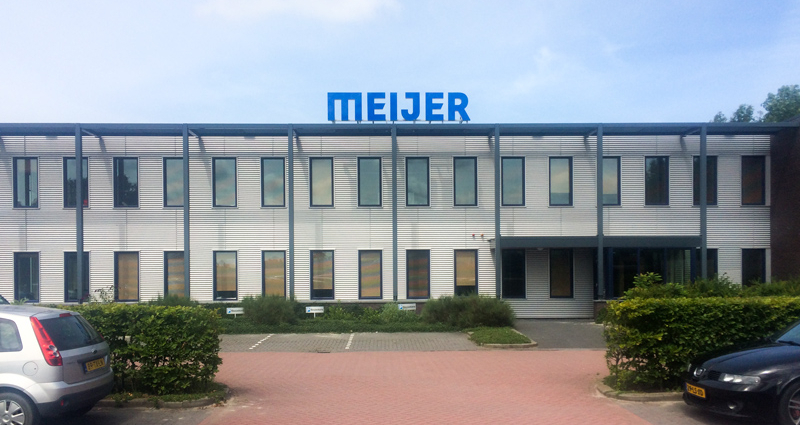 Meijer Handling Solutions (MHS), with its head office in St. Jacobiparochie, The Netherlands, is world’s largest manufacturer of hydraulic telescopic lift truck forks which are sold under the trade name KOOI-REACHFORKS®. Since 2000 MHS has taken over sales and marketing of KOOI BV (manufacturer of the well-known KOOI-AAP mountable lift truck). MHS has succeeded in increasing the market sector enormously. With its integrated synchronisation system, which guarantees 100% equal movement, and because the forks meet the legal safety standards, KOOI-REACHFORKS® are more often specified by all well-established lift truck producers and end users. The know-how that MHS has gained since the introduction in 1980 has made KOOI-REACHFORKS® a standard in the logistic sector.